Written by two LDS women — one (Avery) a history professor and the other (Newell) an independent writer in Salt Lake City, this award-winning* biography of the first wife of Mormon founder Joseph Smith, Jr., is the fruit of nine years of extensive research, and has been well-received by Mormon scholars, including the late BYU historian Marvin Hill. "Emma rose up in revolt against the doctrine of polygamy, which she found personally odious, and in direct conflict with the Book of Mormon." The authors tell us in their introduction that they have written, "neither to support nor to dispute doctrine," and they cite the words of General Authority Brigham H. Roberts to express their guiding philosophy for treating the facts: "to frankly state events as they occurred, in full consideration of all related circumstances, allowing the line of condemnation or justification to fall where it may ..."
The book's title expresses the fact that for many Emma's legacy has come down through history as an enigma: though a model of the virtuous, supportive and submissive wife, Emma rose up in revolt against the doctrine of polygamy, which she found personally odious, and in direct conflict with the Book of Mormon. She stubbornly opposed Joseph at every turn in his attempt to practice and teach plurality of wives. The authors present a mountain of evidence to dismiss the negative picture of Emma as strong-willed and shrewish — a caricature spawned by Brigham Young, who deeply resented Emma's adamant rejection of polygamy, and feared the refusal of the slain prophet's widow to make the journey to Utah would harm the vulnerable sect. It is striking to learn that while Emma was polygamy's tireless foe, she was neither a prudish nor judgmental woman. The book documents that Emma was a personal witness to Joseph's infidelity with 19-year-old Fanny Alger during their years in Kirtland, Ohio, and yet, she was ever willing to forgive her husband for this and other sexual indiscretions. What she did find intolerable, however, was Joseph's attempts to build an elaborate doctrinal justification for the violation of the monogamous marriage bed. While Emma Smith is the central character in this book, it also marshals damning evidence against the duplicitous character of her first husband. In Nauvoo, 38-year-old Joseph repeatedly used the claim of divine revelation to coerce teenage girls to become his wives. Surely a more self-serving string of revelations would be difficult to imagine. One cannot avoid the irony in the fact that on the very night before the arrest that would lead to his brutal murder, Joseph was secretly plotting to use his fugitive status as an occasion for a period of protracted cohabitation with several of his young plural wives. And all the while he was writing labored expressions of intimacy to the unsuspecting Emma. 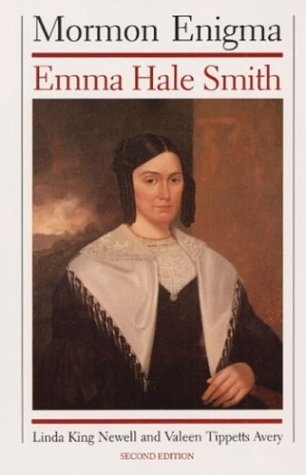 the [Newell and Avery] biography of Emma Hale Smith was deeply disturbing to me for the documentation it provided about Joseph Smith and the origins of polygamy .... Let me be specific. I was shocked and disgusted to discover that Joseph Smith married a fourteen-year-old girl, fully consummated that marriage, and concealed it from Emma. My image of "prophet" did not accommodate this kind of behavior. I could not begin to find holy motives for such behavior ("The Garden God Hath Planted: Explorations Toward a Maturing Faith," in Sunstone, October 1990, 26-27. At least in respect to polygamy, subsequent Mormon history has vindicated the character and convictions of Emma over those of Joseph. The Church finally abandoned the practice in 1890, 11 years after Emma's death. *Mormon Enigma won the 1985 Mormon History Association's Best Book Award and the 1985 John Whitmer Association (RLDS) Best Book Award.